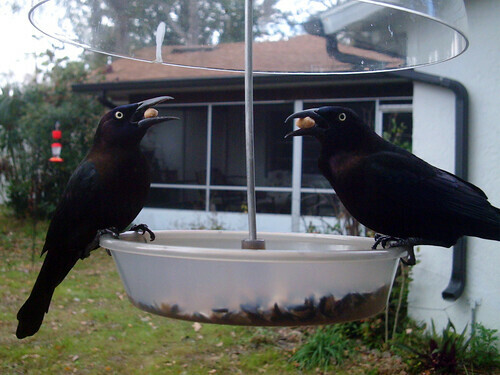 NatureShare is holding a caption contest. Add your best caption to the comments on this photo for your chance to get in the drawing for a copy of Derek Lovitch’s book How to Be a Better Birder. The winner will be randomly selected on 26 January at 10AM EST. Submit a comment on this blog post by Audubon Magazine for a chance to win an Eagle Owl print by Edward Lear. Drawing takes place 31 January 2013. 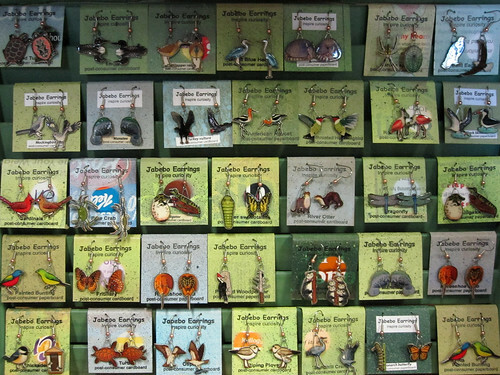 I saw this display of earrings at the Merritt Island NWR visitor center and fell in love. They are designed and produced by a small company called Jabebo. In each pair of earrings, two different images complement each other. I enlarged a few of them below so you can see what I mean. My pictures don’t really do these intricate designs justice; you can see them all (including other science-themed sets besides birds) at the Jabebo website. My favorites are the American Robin & nest, Mockingbird (seen below), Osprey (seen below), Saw-whet Owl, and the Northern Flicker (yellow-shafted). I would love to see a Barred Owl in their offering! The earrings are minature images pressed onto a double layer of post-consumer cereal box cardboard. The display cards are made of the same material. You can read more about the process on the Jabebo website. The earrings are mostly sold at nature centers and wildlife preserves; you can find out where to buy them in your area here.